Viet Lounge is the new offering from Jeff Tan’s Viet Food, a modern Vietnamese restaurant in China Town. 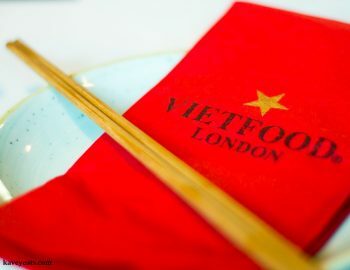 Located on the top floor, above the two-storey restaurant, Viet Lounge offers delicious cocktails and small plate Vietnamese food in a bar setting. 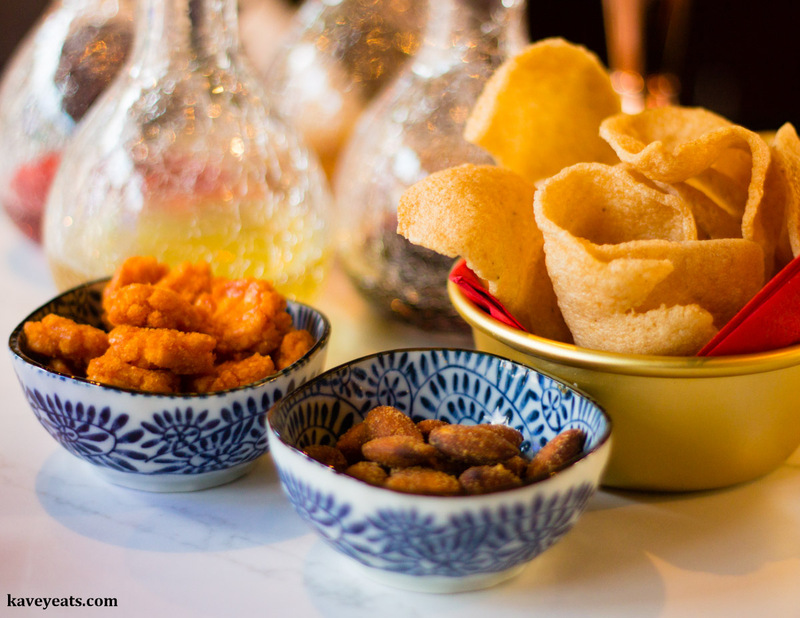 The decor is dominated by beautiful Art Deco stained glass windows, throwing colourful light across a large U-shaped bar counter with chair stools all around. 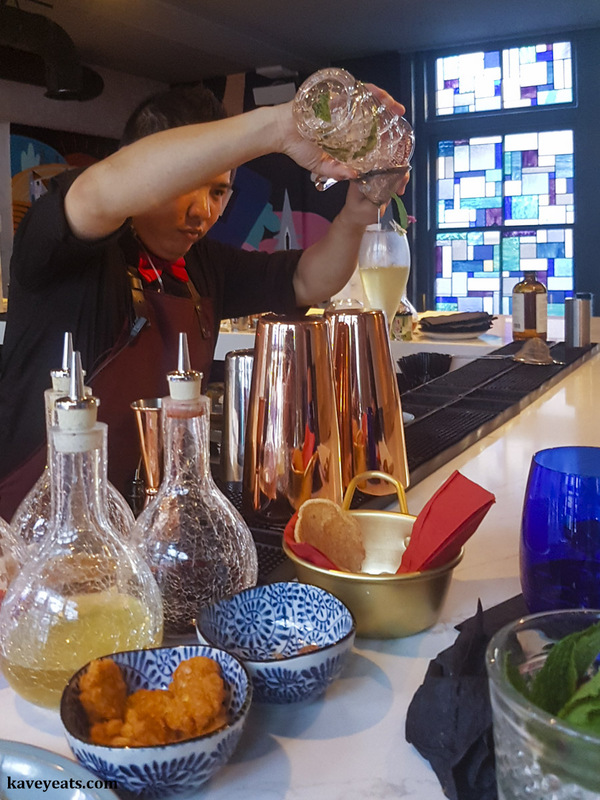 At the centre, mixologist Alex Looi creates cocktails to suit each customer, either from the extensive menu or by asking what you like and riffing a cocktail to suit your taste or mood. 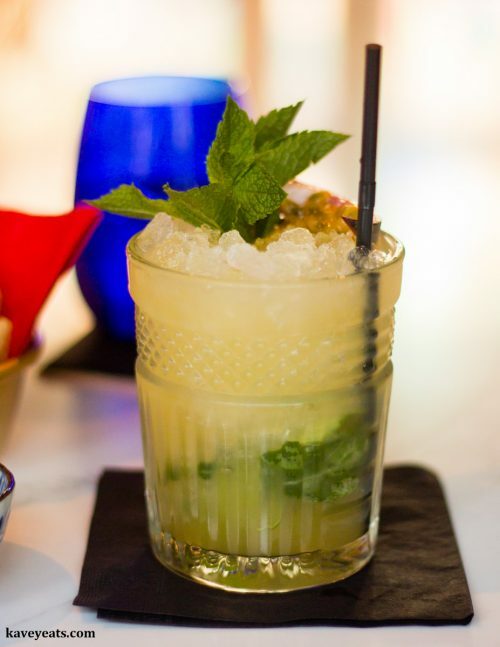 There are some great cocktails on the menu, especially for those of us who like sweeter tipples and are somewhat excluded by the recent trend in cocktail menus for everything sour or bitter. 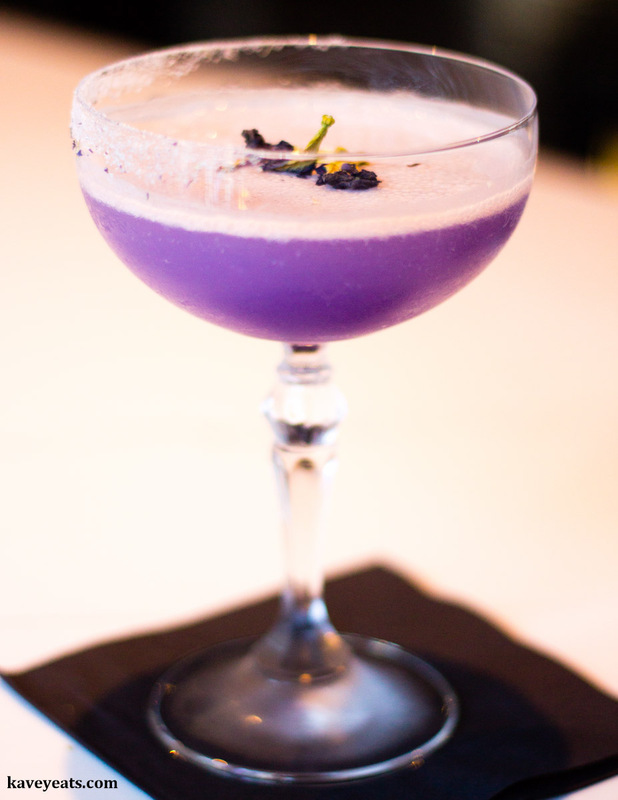 For my first drink Alex made something up for me, after that I tried a Liang Jiu (£8.50), sweet and beautifully purple from the butterfly pea flowers, an ingredient I only recently came across for the first time, in Thailand. 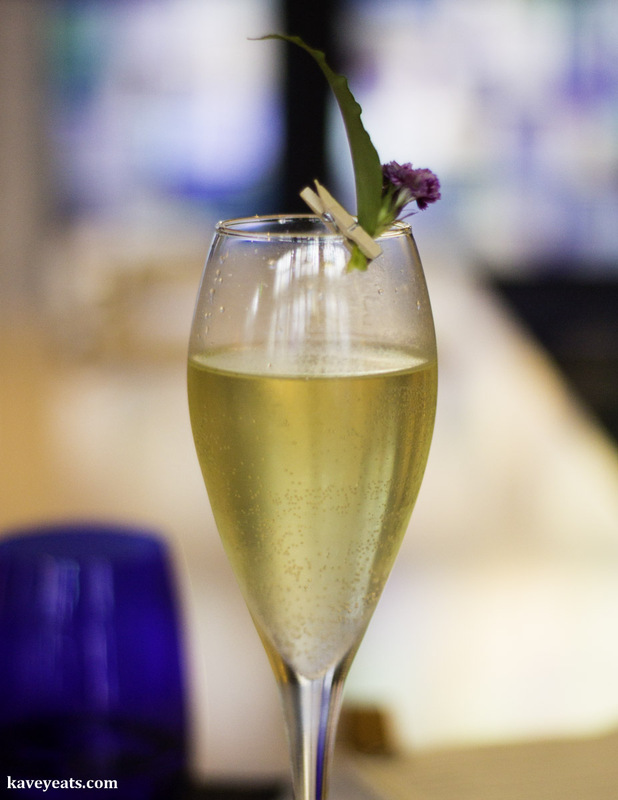 My friend also had a custom-concoction first, followed by the Lemongrass Bubble (£8.50), a lemongrass, ginger, basil and prosecco combination. 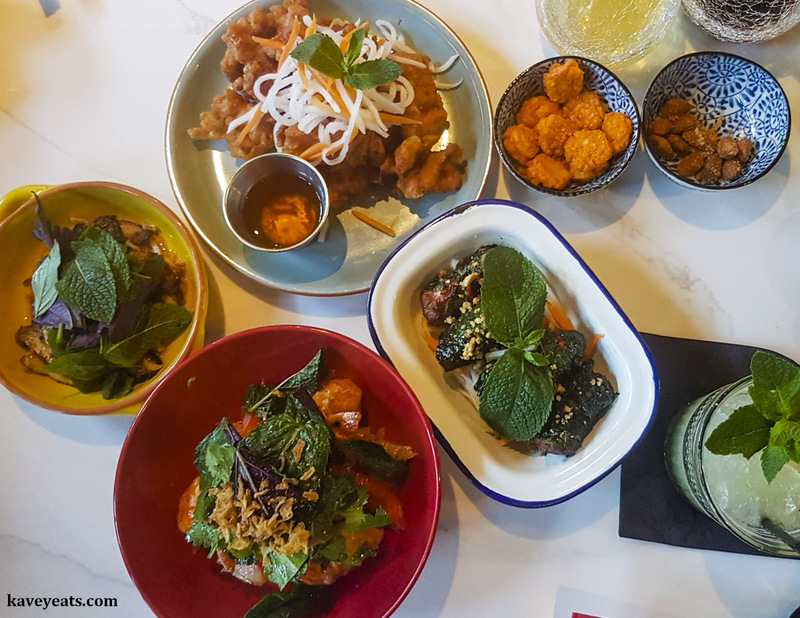 You can pop to the bar for a drink before dinner downstairs, but Viet Lounge also has a dedicated menu of small plates that are perfect for a meal staying put at the bar. Octopus Salsa, grilled with homemade dressing (£7.20) was beautifully tender and the dressing light and refreshing. 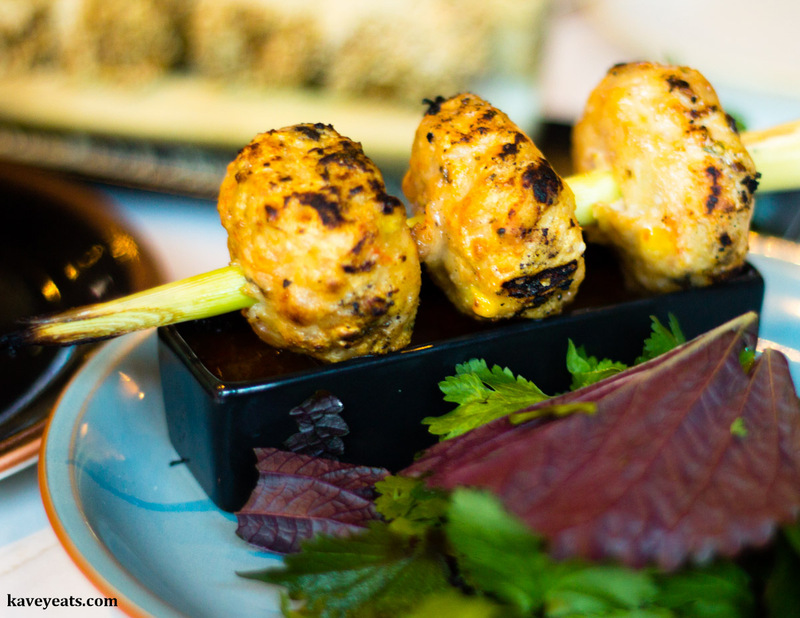 Sweet Corn Crab Balls, grilled with homemade basil chilli sauce (£6.50) were cooked and served speared on a lemongrass stalk. They were moist and delicious, even though neither crab nor sweet corn came through clearly in the flavour. We loved the ‘Bo la lot’ Grilled betel leaf-wrapped minced beef (£5.50) which were tender, savoury and disappeared with unseemly haste! 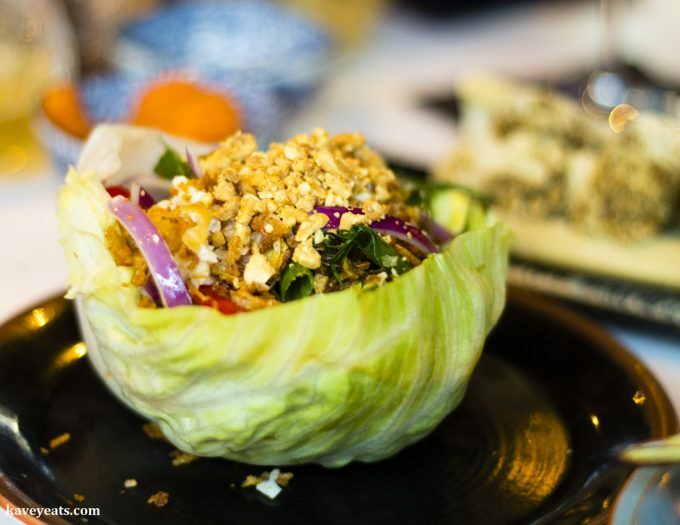 Crispy Soft Shell Crab, with five spice herbs (£8.80) was served within a salad-leaf bowl alongside a delicious mixed salad. The pieces of battered crab were meaty and light, and worked well with the crunch of the other ingredients. I liked the Hanoi Beef, braised with homemade fish sauce & black pepper crumble (£7.20) more than my friend, who found the meat too sweet for his tastes. 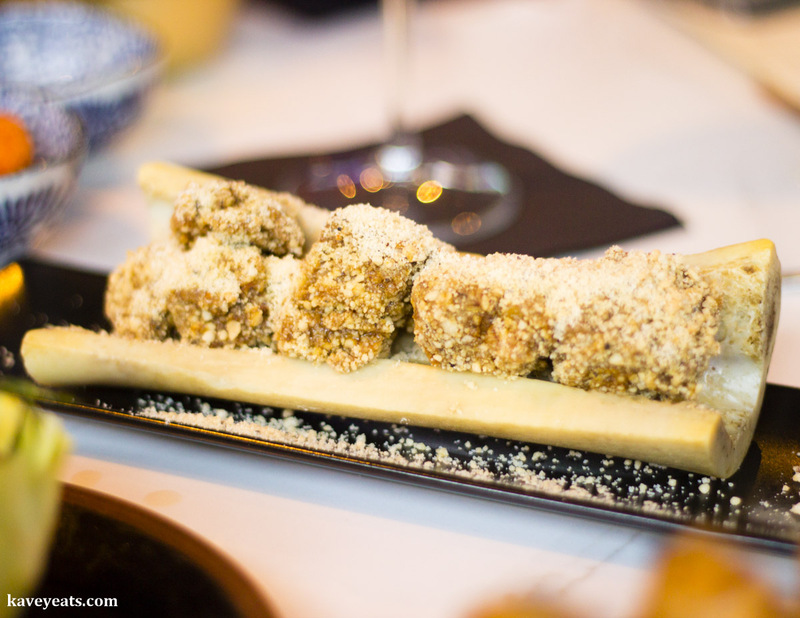 The beef was cooked long and slow, making it meltingly soft, and the flavour was much like a coconut-heavy rendang. I liked the hint of sweetness, and loved the crumble coating too. The Pork Sowbelly, deep fried in chef special marinated sauce (£6.80) is my friend’s favourite dish, and I also really enjoy it. 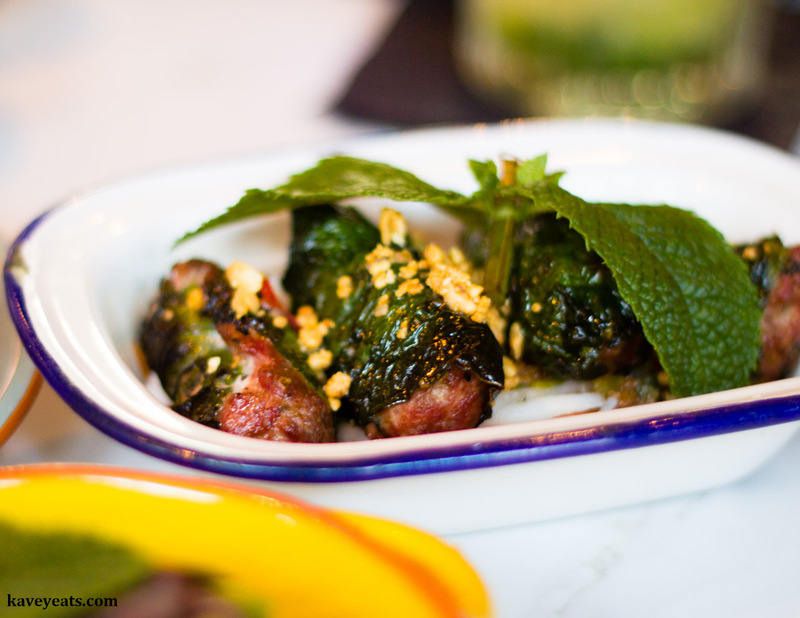 The pork is really tender and has a subtle but absolutely delicious flavour. The sauce helps to cut through the fat. 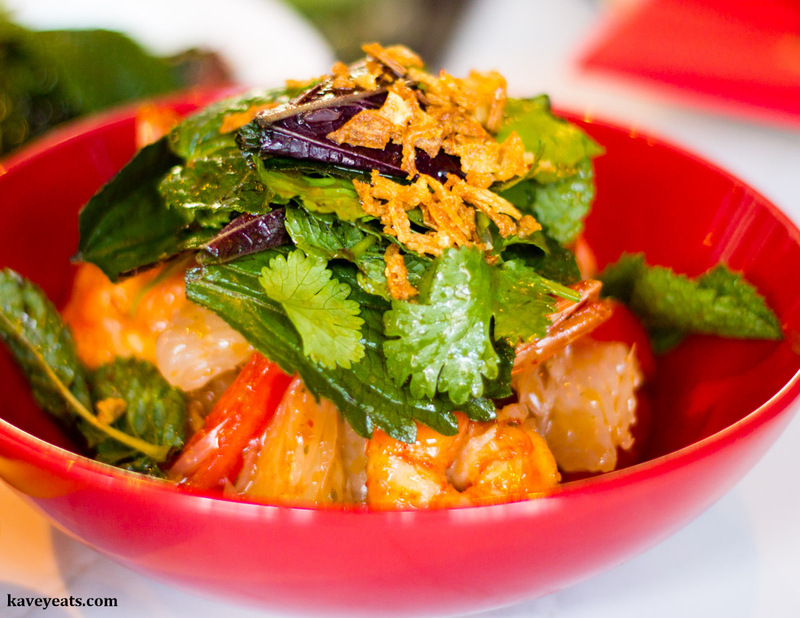 The Pomelo Fresh Water Prawn Salad, with homemade sweet chilli sauce (£6.80) is a classic South East Asian salad with a really tasty dressing and big chunks of pomelo mixed in wit tomatoes, salad and herb leaves and juicy prawns. Delicious! Portion sizes for all the dishes are very generous for the price point, which ranges from £4.80 to to £8.80 per dish. Two to three plates per person is plenty for a decent meal. With seven dishes between two of us, we definitely had a little too much for comfort! Kavey Eats dined as guests of Viet Lounge for this review. 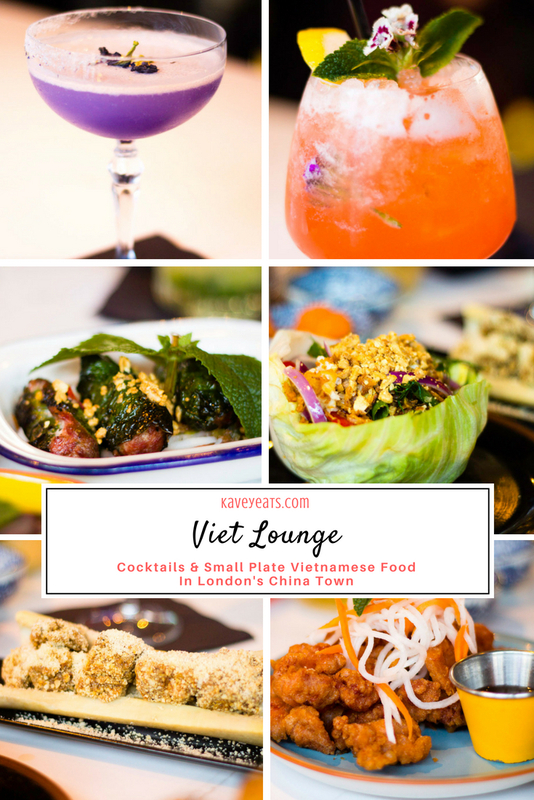 20 Comments to "Cocktails & Small Plates at Viet Lounge, in London’s China Town"
I love small plates, means I can try more! Looks delish! Love Viet cuisine? I’ve only recently got into Vietnamese food – I’m the only one out of my friends who has never visited Vietnam so until a few months ago didn’t get the hype about the food. I’m now hooked so will definitely have to try this out!!! I’ve never visited either but enjoyed the food for many years. Really want to visit! That is some seriously beautiful looking food! Love the cocktail garnish with the little clothes pin, and oh my goodness I just want to dive into each and every plate! Haa, I got quite excited about that little clothes pin!!! Looks like a great place to go for a romantic date or a night out with friends. Those sweet corn crab balls are calling my name. I went with a friend, and yes, was a nice place to chat! my kind of food I love appetizers and cocktails what a fun party this makes. I love everything here not sure what I would eat first! We were so full, and yet there was more on the menu I wanted to try! What a fabulous looking place. The cocktails looks amazing, loving the purple colour. Sounds like you really enjoyed your meal. Yes, so pretty and neither lavender nor violet, the two flavours I associate with purple in European food. 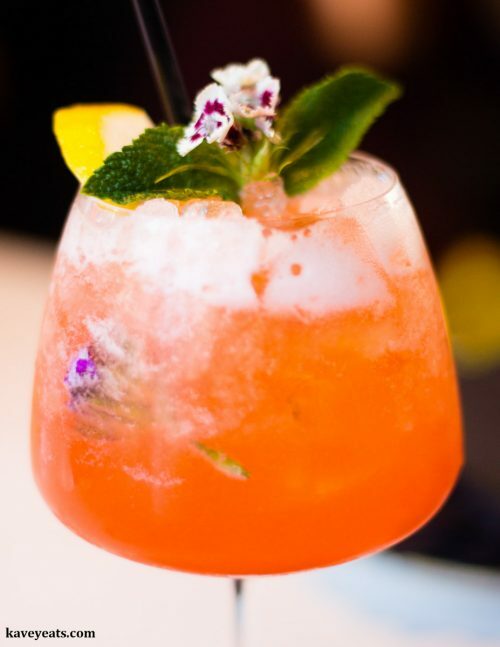 all the cocktails look so delicious and the food so amazing presented!! The purple cocktail looks amazing. 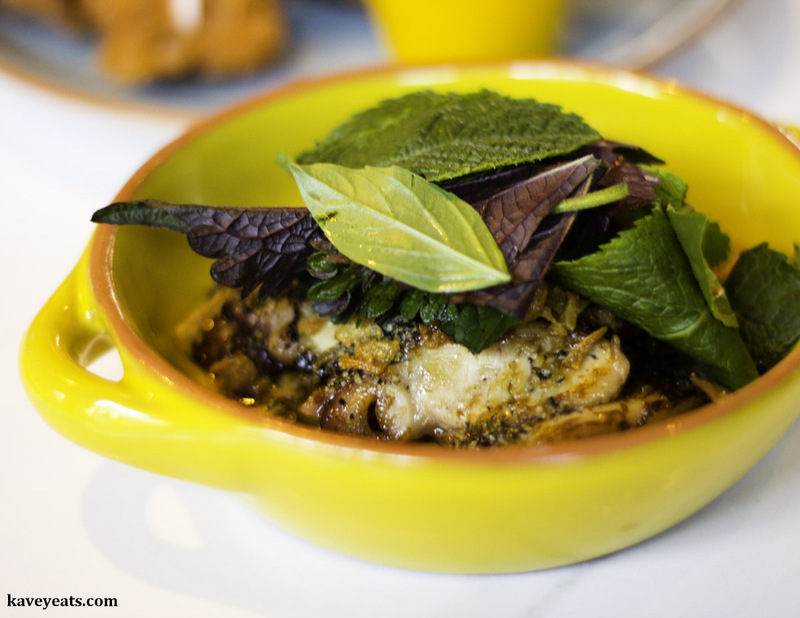 I love any restaurant that has small sharing plates. Great for a romantic dinner. Oh those cocktails look rather good, even though it’s only lunchtime as I write this. 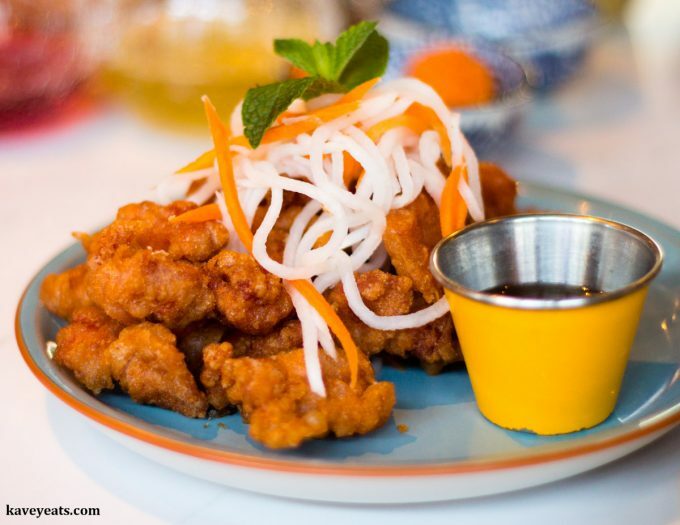 I love Vietnamese food and I love cocktails! Got to visit this soon! Ooh, all of the food looks great! It has been plated so beautifully! WOW everything looks delicious. And I love a good cocktail with so many choices. Great pics!